Thanks to Charlie (Charles E.) Axtell (12-113) for the pictures, all from 1993. And thanks to Holly Boone Keys (Anne Axtell Boone descendant) for the tower picture from 1999. Young William Wesley Axtell was 1 1/2 in these pictures. 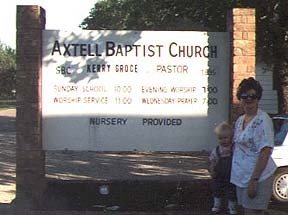 The Axtell Baptist Church was founded 1895. The road behind Charlie is "Old Axtell Rd", although no old Axtells live on it. 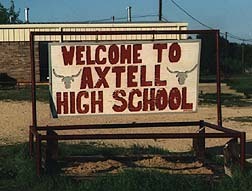 There is no Axtell City Hall. It seems to be inside a little shack they call the water department. 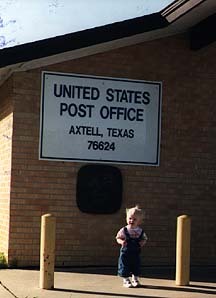 The only buildings in the town are: Axtell High School (the Elementary and Jr. High are in a building next door), Axtell Baptist Church, Axtell Post Office and the Axtell "Water Dept." 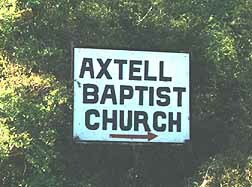 There is also an Axtell Cemetery across the street from the Axtell Baptist Church, however my wife and I could not find a single Axtell headstone. No one seemed to know how the town got its name and there are no Axtells listed in the phonebook. 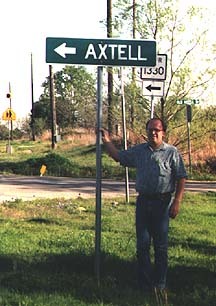 Axtell, Texas is located about 10 miles east of Waco, Texas and about 5 miles from where the religious sect, the Branch Davidians, killed themselves in the FBI standoff.